Quite simply the world’s fastest graphics software. Powerful illustration tools, innovative photo editing, flexible page layout and unrivalled WYSIWYG web design. A single application for all your creative work. Xara Designer Pro is our flagship product and includes all the illustration, photo editing, DTP and web design features of Photo & Graphic Designer, Web Designer Premium and Page & Layout Designer. 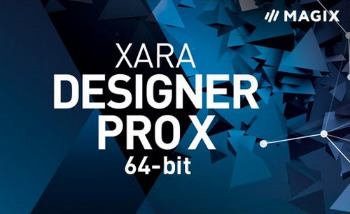 Xara Designer Pro is based on one of the world’s most sophisticated, high performance vector rendering engines. The ultra fast processing, even with complex illustrations or very high resolution photos, makes it a pleasure to experiment. Don’t let your software get in the way of your creativity! Xara Designer Pro’s Direct Action Tools allow you to create effects such as transparency, shadows, bevels or gradient fills in an interactive, fast and intuitive way. No distracting dialogs – simply drag on the object! The Zoom tool allows magnification up to 25,000%, perfect for detailed work. And it’s super-fast and resolution independent too. Instead of dragging outlines when you draw, move, rotate or resize objects, Designer Pro offers solid live object manipulation, which simply makes it much easier to see what you’re doing! Only Designer Pro is fast enough to do this on complex vector graphics. You can enter your text at any angle and you can also set your text along a curved path. Additionally, just like any drawn object in Designer Pro, you can freely resize it on the page, and produce creative display text by applying any of the effects, such as transparency, fills, molds and so on – and yet the text remains editable. You have full word processor style control over the text appearance and formatting. You can create Text Styles, alter justification, tracking & kerning, indents/outdents and tabs and line spacing and easily create bulleted or numbered lists (with your own custom bullets and numbers if you wish). And there’s a spell checker. Uniquely Designer Pro can publish your multi-page print document on the web as a single scrollable document – it’s easy to view, totally WYSIWYG, and perfect for fast skimming and browsing of long documents or sharing your documents with others, without the bother of PDF. The Quickshape tools (rectangle, circle etc) allow you to draw pre-set shapes very quickly and easily. Editing shapes and lines is easy and the Freehand line drawing tool even offers a slider for retroactive smoothing after you’ve drawn your line. The powerful Shape Builder and Shape Eraser tools allow you to easily erase and build on your image, whether it’s a vector drawing or a photo. Take any shape, and just drag on the face to create a beautifully lit and shaded 3D version. Drag on the sides to extend the extrude depth. It couldn’t be easier. The blend tool tweens or blends from one shape to another. It’s ultra-fast, click-drag simple, works with vector shapes, text and photos. Blends can be used to create complex highlights, blurred edges on objects, repetitive patterns and many other effects, in other words it’s a vital tool for creative design. Designer performs blending in a very quick and memory-efficient way compared to other drawing packages – meaning less waiting for you and less draining of your systems resources. Live Effects are plug-in effects that can be applied to any object, including vector drawings – they are called Live Effects because the vector object remains editable even after applying the effect. Most modern Photoshop plug-ins work as Live Effects, giving access to a huge range of special effects (and many plug-ins are included). Xara Designer Pro offers several powerful tools that allow you to add realistic effects with a single click. Apply, remove, and modify semi-transparent (or ‘soft’) shadows to any object with the Shadow tool. Use the Bevel tool to add bevels to any object, giving them the realistic appearance of depth. And add contours around objects with the Contour tool. All resolution independent (don’t lose quality when you scale them)! Xara Designer Pro photo handling beats other graphics programs on many fronts. It’s much, much faster, produces smaller files and it’s non-destructive. It makes the perfect photo composition tool. Xara Designer Pro includes a complete website creation feature that enables you to design state of the art, mobile-ready websites with ease, including mouseover and pop-up effects, NavBars and menus, animations and widgets. One click preview and free web hosting included. It’s the world’s most advanced WYSIWYG web page creator – and with no HTML skills required! Xara Designer Pro gives you total design freedom – using drag and drop you can literally place anything, anywhere on the page. And things which are normally difficult to achieve in HTML are a snap in Xara Designer Pro – for example text with curved edges, text or graphics at an angle, text flowing around objects – no problem! Liquid text flow around objects; easy mouseover, thumbnail and pop-up creation; automatic adjustment of photos to the correct web resolution; one-click change of site wide theme colors and shades; automatic color matching of imported objects such as buttons; a concept of ‘repeating objects’ such as headings and button bars – edit one instance and they all update; buttons and text panels that automatically stretch as you change the text, and smart repositioning of objects and resizing of pages as you add or delete text.